“This drop-dead gorgeous app for digital artists packs a rich feature set into a surprisingly intuitive interface.” WIRED Magazine. 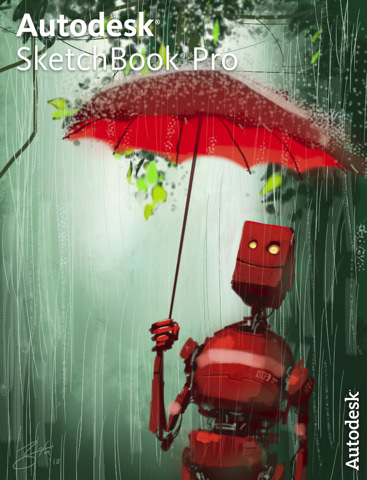 If you love SketchBook Mobile for iPhone, you will adore SketchBook Pro on the iPad. • Individual brushes can now be reset to factory settings by pressing and holding on their icons until the reset dialogue appears. • SketchBook 1.1 introduces Blend Modes to the layer editor. • When enabled on a layer this feature allows users to paint only on top of existing paint strokes. This is very useful for repainting, shading or other detailed work that requires exact detail within an area that has already been painted. • A new Template Library is now available from the image import button in the Layer Editor. This library includes a variety of grids, perspective reference and ruled paper. • When connected to a compatible display through either the Apple Component AV Cable or the Apple Dock Connector to VGA adaptor your canvas and gallery can be mirrored to an external display or television. • Customizable double tap canvas shortcuts. You can assign one of the following shortcuts to each corner: Clear Layer, Frame Canvas, Undo, Redo, Last Brush, Last Color.